The complete look! Now where's the warm weather so we can rock this outfit? Denim is often a major staple in a woman's closet, and this week we are dressing it up for Spring. Starting off with a comfy and stylish pair that is perfect for day to evening wear. M.i.h Jeans 'Bridge' style are woven with the perfect amount of stretch for a close, easy fit. Designed with a high-rise waist, they're subtly faded and have a skinny leg that hits just above the ankle. Bringing in some unexpected drama is a crisp white top that will have heads turning. We loved this Rodarte blouse the minute we saw it on the Spring 2019 runway. 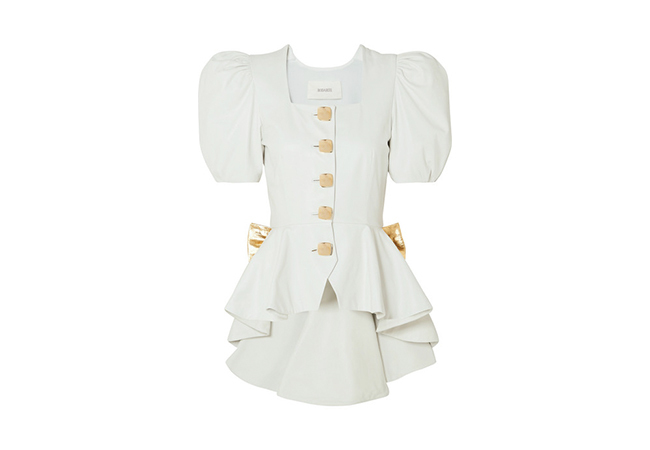 Cut from supple white leather, it has romantic puffed sleeves, a square neckline and ruffled peplum that is longer at the back and topped with an oversized gold bow. Since there's that beautiful burst of metallic gold in this chic top, we wanted to bring out that dazzling shine even more with the accessories. 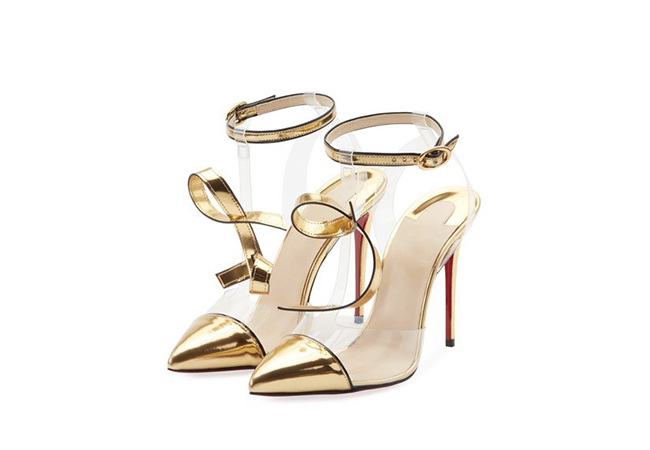 Inspired by black-tie dressing, Christian Louboutin's 'Alta Firma' sandals are what footwear dreams are made of. Crafted in Italy from metallic leather, the clear PVC paneling is appliquéd with gold scrolls shaped into the letters 'C' and 'L' , after the designer's initials. They are set on a slender 100mm stiletto heel and have sleek pointy toes. Continuing our 'gold-digging' is a bag that will create major arm candy envy. 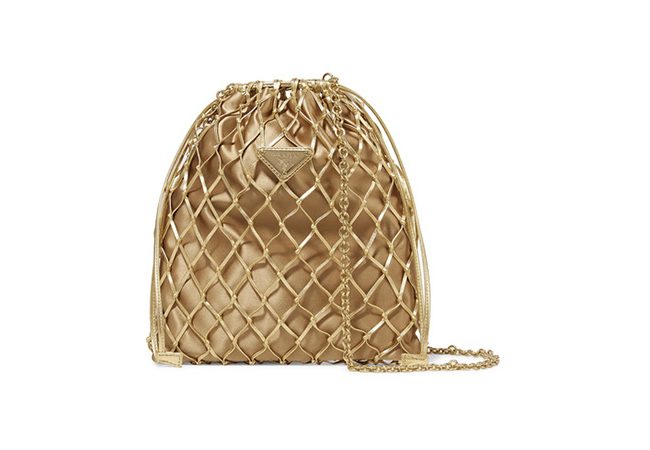 Prada's macramé bucket bag isn't just meant for warm weather or tropical locales - the gold leather and lustrous satin lining make it elegant enough for hitting the town, too. It has enough space for daily essentials and a detachable chain strap so you can wear it as a cross-body. We wanted to keep jewelry at a minimum, so we opted for a delicate piece with just the slightest hint of bling. This dainty 18-karat gold Pippa Small bracelet is embellished with a cluster of diamonds offering an ideal dose of sparkle. Rounding things off, nothing seals up a beautiful new season look like a pop of color. 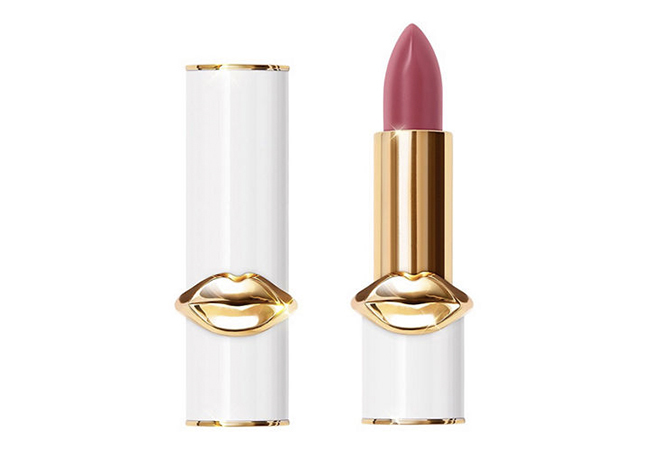 Corals are always a gorgeous option for spring and summer looks, and this lip shade by Pat McGrath Labs is a must-have. This formula is a divine balm that leaves lips sensually smooth with a dewy, luminous finish. Whether you choose to take this look for a day about town or ladies night, you are sure to be one stylish 'Blue Jean Baby' wherever you turn up.